1. 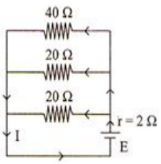 Based on the figure below, if the source of electromotive force (emf) is 24 Volt, determine electric current I.
Resistor 40 Ohm, 20 Ohm, and 20 Ohm. 2. Based on figure below, if R1 = 3 Ω, R2 = 4 Ω, R3 = 4 Ω and electric current is 0.5 A. Determine electric voltage.